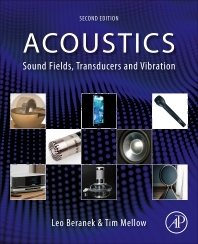 Acoustics: Sound Fields, Transducers and Vibration, Second Edition guides readers through the basics of sound fields, the laws governing sound generation, radiation, and propagation, and general terminology. Specific sections cover microphones (electromagnetic, electrostatic, and ribbon), earphones, and horns, loudspeaker enclosures, baffles and transmission lines, miniature applications (e.g. MEMS microphones and micro speakers in tablets and smart phones), sound in enclosures of all sizes, such as school rooms, offices, auditoriums and living rooms, and fluid-structure interaction. Numerical examples and summary charts are given throughout the text to make the material easily applicable to practical design. A chapter on vibrating surfaces (membranes, plates, and shells). Readers will find this to be a valuable resource for experimenters, acoustical consultants, and to those who anticipate being engineering designers of audio equipment. It will serve as both a text for students in engineering departments and as a valuable reference for practicing engineers. Educated at Harvard and Cornell, Dr. Leo Beranek was an acoustical design consultant. Recent work includes several concert halls in Japan. In 1948 he co-founded Bolt, Beranek and Newman (now BBN Technologies) to provide consultation for major auditoriums. BBN also reduced jet noise, developed the ARPANET (internet forerunner), and founded Channel 5 among other achievements. Leo has won numerous awards and fellowships including AES, ASA and ASME gold medals, Presidential National Medal of Science, and ICA Lifetime Achievement in Science Award. He has published 13 books. Tim Mellow was educated at Boundary Oak School and Lancing College before obtaining a B.Sc. in Electrical Engineering and Electronics from the University of Dundee, Scotland, in 1985. A career as a Design engineer at BICC, Marconi, Thorn EMI, Racal, VTech, and Nokia followed. In 2011, he co-founded Mellow Acoustics Ltd with Philip Trevelyan to both provide an acoustical consultancy service and to develop high-end audio products. Tim takes a keen interest in music and plays the piano in his spare time. He has published many articles on audio and acoustics over the years, including 11 papers in the Journal of the Acoustical Society of America, mainly with Leo Kärkkäinen as co-author.